Swiss Alps in summer pictures, photos. 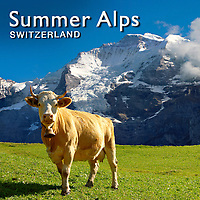 Images of Alpine pastures & alpine flowers as well as images of Matterhorn, Grindelwald, Eiger. Also buy on line as stock photos or photo art prints. Alpine plants are plants that grow in the alpine climate, which occurs at high elevation and above the tree line. Alpine plants grow together as a plant community in alpine tundra.